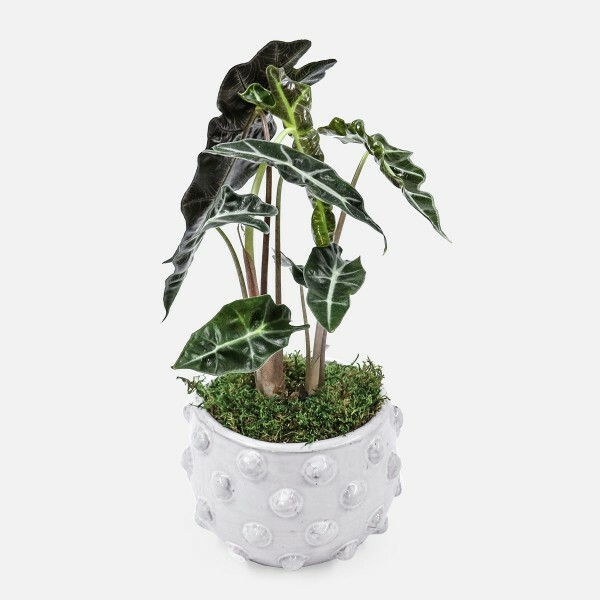 Perfect for medium to low sunlight, an Alocasia Polly comes planted in a modern white ceramic pot. 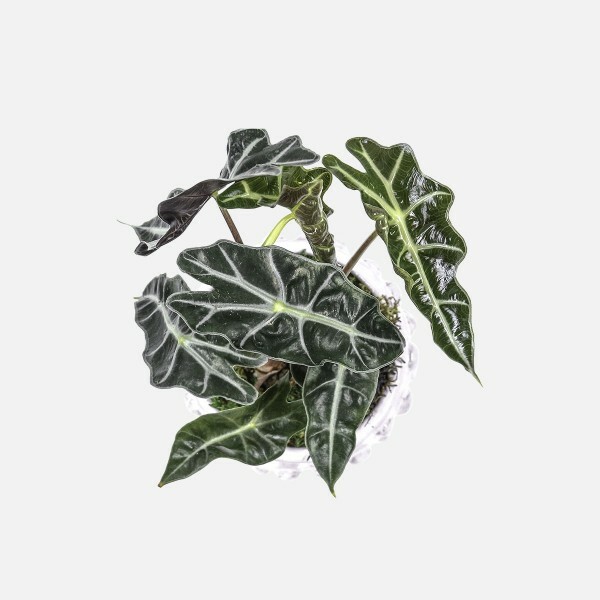 Also called African Mask, Alocasia Polly performs best in bright, indirect sunlight but can tolerate low lighting conditions as well. Here it is planted in a modern white ceramic pot. Check the soil for dampness once a week. If dry, add about a cup of water, keeping in mind that any excess will build up in the bottom and should be avoided. Mist to increase humidity and avoid cold drafts for best results. Send beautiful plants in NYC from your local Manhattan florist, PlantShed. Free hand-delivery for Manhattan orders over $100 (per location). Check for dryness once a week. 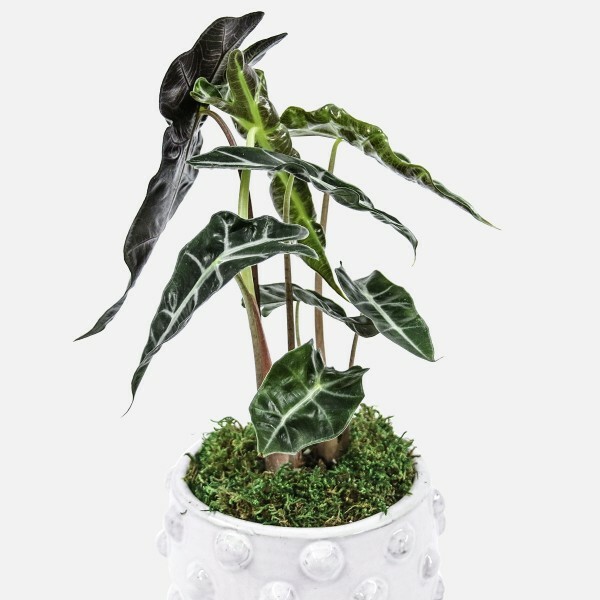 Thrives in an environment with high humidity. Water less in winter when plant is dormant. Needs a little extra care. Just avoid direct sunlight and maintain high humidity. Alocasias remove toxins that can build up in indoor spaces. 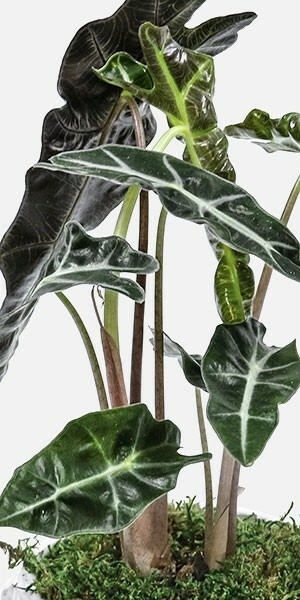 A general rule of thumb is 1 medium houseplant per 100 square feet of space effectively cleans the air we breathe. Prefers warm conditions 70-85°F. Keep away from drafty windows and air conditioners. A peaty All-Purpose potting soil with good drainage works best. Be sure the bulbous rhizomes at the base of plant are potted above the soil. Prune yellow or damaged stems down to soil level. Leaves will fade or die when plant goes dormant but plant is still alive. To propagate, large plants can be divided in the spring. Sorry! All parts of the plant are considered toxic if consumed.